Spader Freight Services is looking for experienced and motivated Diesel Mechanics. Please email your resume to recruiting@spaderfreight.com to see if you would make a good fit. Clyde Truck & Trailer is an affiliate company with Spader Freight Services. It handles all of their fleet maintenance and also services equipment for outside carriers. CTTR has an immediate opening for a Diesel Technician at our Clyde, OH location. 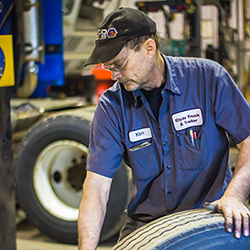 At Clyde Truck & Trailer you can earn EXCELLENT PAY and BENEFITS! Starting pay is based on experience, Class A or B CDL possession, and ASE Certification. Hours are 3PM-1AM Monday-Thursday or 7AM-4PM Monday-Friday. Full benefits, 401k, paid vacation and holidays. Uniforms provided + winter clothing + boot reimbursement annually. Please email your resume to recruiting@spaderfreight.com to see if you would make a good fit.